The winners have been announced for the 2014 NAA - USA Today Marketing Competition. Come and see all of this year's winners at the Trade Show at Conference & Show! Ballots were sent by U.S. Postal Mail on June 2. All ballots must be postmarked no later than July 1 and received at the NAA by 4 p.m. CDT July 3. The envelope must have the member's name and number in order to be counted as valid. View the full list of contestants! Seventy-six men and 18 women will compete in this year’s competition. The IAC preliminaries will begin at 8 a.m. Friday, July 11, at the Galt House Hotel in Louisville, Ky. The top seven female contestants and 15 male contestants advance to the finals, which will begin at 6 p.m.
NAA members share why they belong to the world's largest association for professional auctioneers! Register for #NAACS14 now at www.conferenceandshow.com. 06/24/2014 2:36 PM - Industrial/transportation auctioneers, watch inbox tmrw for survey from NAA. Working with Northcoast Research on data for your niche! 06/24/2014 9:49 AM - We're looking for a few backup auctioneers willing to help sell at the Fun Auction. Email jpeterson@auctioneers.org to volunteer! 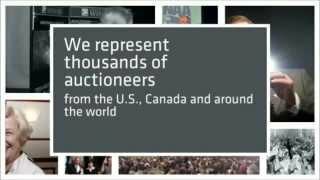 © 2014 National Auctioneers Association. All rights reserved.